Visit the new visitor Centre of Richard III in Leicester and follow the story of the most ambitious archaeological projects ever attempted: no less than a search for the lost grave of King Richard III. The last English king to die in battle. Incredibly, the excavation uncovered not only the friary of Grey Friars but also a battle-scarred skeleton with spinal curvature. On 4th February 2013, the University announced to the world's press that these were the remains of King Richard III. This journey is rural and even remote at times, yet flings in and out of colourful hubs that tell gripping stories of canal-life to the passing traveller. The East Midlands or Leicester Ring is an idyllic rollercoaster sweeping through wide open views and some of the best-loved highlights of England's canals. 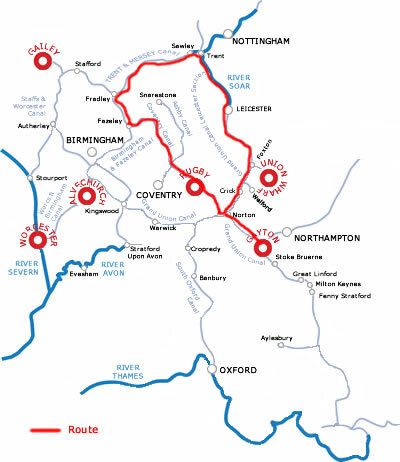 With peaceful disregard for boundaries, the route meanders through five counties, Staffordshire, Warwickshire, Leicestershire, Northamptonshire and Derbyshire. And with rivers, aqueducts, lock staircase flights and 5 tunnels to navigate, this ring is a challenge to test the helmsman's skills. 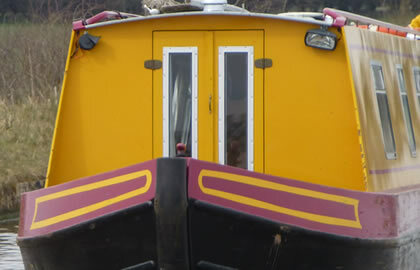 Head back down the Northampton Arm of the Grand Union to Gayton Junction. (Turn right out of the marina). At Gayton Junction turn right down the Grand Union Canal. Soon you will pass the village of Bugbrooke, and the Wharf Inn is by Bridge 36, or there is a couple of village pubs if you walk into the village. Bugbrooke is 1.5 hours from Gayton. You will probably want to move on & head for the village of Weedon which is just over 2 hours from Gayton & ideal for a 1st nights stop, there is a small aqueduct over a road as you approach the village. There are takeaways, stores & pubs in Weedon , you can moor up near the Church. The Heart of England pub by bridge 24 is a good family pub. Just before you get to Weedon is the Narrowboat Inn beside bridge 26, with canalside seating and mooring. There is a selection of antique shops here which are well worth exploring. A short while after leaving Weedon you will pass Brockhall Park on your right, (access from Bridge 18). The Hall here is Tudor in part, and in the Victorian courtyard farm buildings has been established The Heart of the Shires Shopping Village. The Shopping village has about 25 widely ranging shops, including a tearoom, so is well worth a visit. The canal continues through open landscape until you begin the climb up to the Norton Junction through a series of 7 locks called the Buckby locks. The New Inn is canalside at Buckby Top Lock, with canalside seating and moorings. It is 5 hours 20 minutes from Gayton marina to here, or 3 hours from Weedon to here. At Norton Junction you can then go down the Grand Union west towards Braunston.From Norton Junction to Braunston the canal runs westward through hills and wooded country, then into a wooded cutting which leads to Braunston Tunnel. Off to the north on your right you will pass the small village of Welton on a hill. At Bridge 6 ¾ mile from the Canal you can find a 400 yr old pub – The White Horse Inn. Braunston Tunnel was opened in 1796 & is 2042 yards long. Long rows of moored craft flank the canal, but there is usually plenty of places to moor, as it is worth strolling into Braunston as there are a fine selection of old buildings here. The British Waterways office in the Stop House, was originally the Toll office between the Oxford and the Grand Union canal. By lock 3 there is a haunted pub- the Admiral Nelson. In Braunston itself there is the Wheatsheaf which also has a Chinese & Thai takeaway. The Millhouse Hotel has a canalside garden, and the Old plough in the High street dates from 1672. The village has stores & a takeaway. At Braunston Turn turn right up the Oxford canal, the canal runs through wide open country for quite a mile, only momentarily interrupted by the M45 just after Barby Bridge. Continuing up the Oxford canal Rugby comes in to sight, you descend the Hilmorton Locks and the canal swings in a wide arc around the town. There are shops near bridge 59 to the south, and a picnic area below bridge 58 with a huge Tesco supermarket nearby. Rugby is a large town with many shops and of course is the home of the game of Rugby. It is 30 minutes walk to the town centre. If you need to stock up on provisions, the selection of shops to supply food is brilliant in Rugby, offering deli’s, supermarkets, organic shops, local produce, bakers and butchers, and making it worth a look just for the shopping opportunities alone. The centre of Rugby is a very pleasant place offering nice parkland and places to eat and drink in abundance. There is a pedestrianised shopping centre and an open market with a town crier. The town and borough has much more to offer than its unique connection with the famous game. It has links to great literary figures such as Rupert Brooke, Matthew Arnold and Lewis Carroll. Soon you will encounter the short Newbold Tunnel. Newbold Quarry park is beside the canal, it is a local nature reserve, there are wildflowers, butterflies & birds and muntjac deer. The canal continues on this lock free stretch with no villages to speak off, until you reach Brinklow which is about a mile off to your left by Stretton Stop, where you can moor up for the night. There are 3 pubs in Brinklow which can be accessed from the road to your left just before Stretton Wharf. There are stores & a takeaway as well. The canal continues north west through quiet farmland only briefly interrupted by the motorway which is soon left behind for the moment. There are lovely elegant iron bridges along the canal. Soon the first signs of Coventry appear, sharp bends in the canal lead to the stop lock before Hawkesbury Junction which is the end of the Oxford canal before it joins the Coventry canal. The lock has very little difference in depth, so takes very little time to fill up or empty! There is a lovely cast iron bridge after the lock, and to your left is a very attractive disused engine house. The steam engine used in the Engine house was installed in 1821, having been previously used for nearly 100 years at a colliery. The atmospheric steam engine is now housed in Dartmouth Museum. There is also a nice pub canalside- the Greyhound, decorated with canal memorabilia. You turn right here passing the old Engine house on your left. You soon reach the turning to the Ashby Canal which is a lovely canal about 22 miles long with no locks, but maybe do this one another day. You cruise through Nuneaton, but the views are pleasant there is good access & moorings by Boot Bridge 20. The canal winds along the side of a hill out of Nuneaton, the BW Hartshill yard has a lovely clock tower in its old dock. There are pubs in Hartshill south of bridge 31 . The route up the Coventry canal takes you through the attractive Atherstone locks, which is a flight of 11 locks. To the south of bridge 41 is a useful PO & stores, to the north is the town centre of Atherstone. As the canal turns towards Polesworth it passes the remains an old iron swing bridge. Polesworth has stores & takeaways & is a good place to stock up on supplies. You can moor by Bridge 54 The Bulls Head is west of the bridge. At Alvecote marina there is a nice pub & restaurant- The Samuel Barlowe, in the marina. You will have glimpsed through the trees the remains of Alvecote Priory to your left. Carrying on you will pass through Amington, to the south of Bridge 68 is the canal Craft Shop where you can have Buckby canalware painted to order. There is also a friendly Canalside Pub by Bridge 69, The Gate Inn, serving real ale & home cooked meals, there are moorings outside. Reaching Tamworth the Canal runs though suburban housing, turning in a wide sweep south west past Tamworth towards Fazeley Junction. In Tamworth, which was originally a Saxon settlement, there is a Castle near the town centre, open mid Feb-Oct 12.00-17.15. It has a Norman motte, an Elizabethan timbered hall, and Jacobean apartments. Tamworth itself has a Post office, stores, garage, station and cinema. There is also the famous Snowdome (booking may be necessary), where there is everything from skiing, snowboarding. snowmobile, tobogganing, to ice-skating on their real snow indoor slopes. There is a childrens snowplay area for 2-10yrs, where children can build snowmen, enjoy a game of snowballs, or play & slide around in the snow. You will soon reach the only locks on this stretch at Glascote, there are 2 locks fairly close together. There is the Anchor Pub at Anchor Bridge, which serves Real Ale & Indian food (evenings only), & has a garden with moorings. Houses and factories flank the canal as it passes Kettlebrook Wharf, and then it moves briefly into more open country, crossing the River Tame on an impressive aqueduct. The Barge & barrel is situated by Bridge 74 next to Kettlebrook basin, serving real ale & food , with moorings. Also the Three Tuns is alongside the canal. There are useful stores south of Bridge 76. At Fazeley junction , the Coventry Canal meets the Birmingham & Fazeley Canal and continues north west towards Fradley Junction, initially on the Birmingham & Fazeley canal, until it becomes the Coventry Canal once again. You can choose to make a detour down the south arm of the Birmingham & Fazeley Canal if you have children, as there is a large theme park - Drayton Manor - alongside the Canal, at Drayton Manor Bridge – open late March to October 10am to late afternoon. There is an extensive series of exciting rides, including Storm Force Ten, and amusements. There is a winding hole (turning) just past Coleshill Road Bridge. Getting back to the Fazeley Junction you turn North West along the Trent & Mersey Canal towards the Fradley Junction , and you soon reach Peels Wharf which is surrounded by new dwellings & completes at attractive urban scene. Hopwas is a pretty & tidy village with a green, built on the side of a hill. It has a PO, and a convenience store. It is a nice stop for an overnight stay, as on the Canal is the Tame Otter Pub, where real ale & food are served all day, there are moorings available, also here is the Red Lion, food at lunch and in the evenings, steaks are a speciality. The three spires of the 13th century Cathedral in Lichfield, 'the Ladies of the Vale' are a visible landmark for miles around. The modern shopping centre contrasts sharply with the graceful Georgian buildings of the city centre. There are excellent pubs & restaurants and night clubs, with a Farmers market on Sundays. You now turn eastwards towards Shardlow. Moor up here for the night. Before Alrewas Lock, the canal is crossed by the River Trent, and the large weir should be given a wide berth, make sure you have plenty of power to get you safely past. If you make a stopover in Burton on Trent, moor up at the Horninglow Wharf, and walk into the town from there. It is about ¾ mile walk to the National brewery Centre which is a world-class museum and visitor centre that celebrates Burton upon Trent's proud brewing heritage and it's influence on brewing techniques throughout the world. It is open every day, & some evenings. In the centre of town Burton Place Shopping Centre has everything to offer its visitors with a great selection of stores - Burton Place Shopping Centre, Worthington Way, Burton upon Trent, Staffordshire,DE14 1BU. Also visit Claymills pumping station, which houses one of the largest collections of working steam engines. It is ¼ mile from bridge 29, you will see the tall brick chimney from far away. You soon leave Burton on Trent behind and come to the village of Willington, a busy little village with stores & 3 pubs closeby. Shardlow is a pretty village with a restaurant and a Heritage centre near the lock. It takes less than 3 hours to get to Trent Lock, where the River Trent meets the River Soar and the Erewash canal. The Navigation Inn and Steamboat Inn are located canalside, as are the Lockhouse tearooms. At the very busy Trent Lock, go South on the River Soar. Cruising may be restricted in times of flooding. Boaters are reminded that this is basically a River & navigation is liable to flooding in wet weather. There are red flood warning lights along the River Soar. Boats negotiating the junction of the rivers Soar & Trent should keep well away from Thrumpton Weir, which is just downstream of the big iron railway bridge. The River is a tributary of the River Trent & is about 40 miles long. meanders down to Loughborough , with a few villages & pubs on the way. You will soon reach Loughborough, and the Loughborough Navigation becomes the Leicester navigation, and the start of the Grand Union canal. The canal circles Loughborough to a T Junction. You can moor near Loughbrough Wharf, or moor just past Bridge 36, or before Bridge 38. Loughborough has all the usual services for a busy town. The Bell Foundry museum is south of bridge 38, The museum at John Taylor & Co, tells the story of the Bellfoundry going right back to its links with bellfounding in the 13th Century. An extensive range of exhibits and memorabilia tells the story of one of the oldest manufacturing industries in the world. Charnwood museum in Granby street features a wide range of exhibits reflecting the history, geology, archaeology and industries of Charnwood and the surrounding area. Permanent displays include ‘Coming to Charnwood’, ‘The Natural World of Charnwood’, ‘Living off the Land’ and ‘Earning a Living’. Each contains exhibits from the past and present including interactive displays, computers and audio-visuals. Visitors can handle rocks from Charnwood’s volcanic past, walk beneath the giant oak tree, investigate the 4,000 year old burial of the Cossington Boy, visit the Victorian grocers shop or zoom-in on a fly’s eye with the video microscope. Great Central railway in Great central Rd Loughborough is 8 miles of preserved main line taking you back to the days of express steam haulage. Voted number 12 on the list of the 50 greatest railway journeys in the world the Great Central Railway is the UK's only double track, main line heritage railway. It’s the only place in the world where full size steam engines can be seen passing each other – just as it was when steam ruled the rails. Trains run every weekend of the year, bank holidays and selected week days through the summer. You soon pass Barrow on Soar a village to the left of you, with good moorings before Mill bridge 28, and various shops in the village for supplies. There is a train station in the village for those attractions not so close at hand. Barrow deep lock is just that, a very deep lock to change the level of the canal. The Canal continues on to Mountsorrel, which is only a few yards from the canal and is a useful place for supplies. The lock is is very much a waterways show-place, & the extensive moorings and lockside pub, make it a very busy one. (The Waterside Inn by Lock 50).with its nice waterside pub. A chance to see a working farm, a museum of memorabilia & old cars & small animal farm for the kids to touch. Also tea shop & farm shop. Moor up nr the lock, its only a few yards from here to the centre of the village. You pass the village of Cossington, the Cossington Mill restaurant is canalside at Bridge 21 & the Red Lion is west of Cossington Lock, at crossroads up the hill & under the by-pass. Cruise past Watermead Country park and Boating lakes, which are now the attractive remains of old gravel workings. Then to the large city of Leicester. From the River Trent to Leicester West Bridge is 25 miles. In the City of Leicester There are secure moorings at Castle Gardens (on the right past Bridge 2). The city centre is remarkably compact with everything surprisingly close to these moorings. Richard III Visitor Centre - In August 2012, the University of Leicester in collaboration with the Richard III Society and Leicester City Council, began one of the most ambitious archaeological projects ever attempted: no less than a search for the lost grave of King Richard III. The last English king to die in battle. Abbey Pumping Station- 1891 with Victorian steam powered beams engines that used to pump the towns sewerage. Also unique public health exhibition & managers house circa World War 2. Moorings here. Castle Gardens & Motte (where you moor) The Motte or raised mound dates from the 11th C.
Cathedral- Guildhall Lane, dating from 14th & 15th Centuries & restored in 19 C.
Eco House- Environmently friendly show house Tel 0116 285 5489. Buses from High Street. NATIONAL SPACE CENTRE- close to Belgrave Lock 44. A great day out for the whole family is at The National Space Centre. View the space age building as you approach from you narrowboat. The opportunity to explore many facets od space travel, to meet the furthest reaches of our universe face to face & to interact with both science fact & science fiction. Open Tues -Sun all year & Mon pm -school hols. St Mary de castro- Founded in 1107 with excellent examples of Norman glass, stone & wood carving. Haymarket Theatre- Venue for hit shows bound for the West End. www.lhtheatre.co.uk. Phoenix Arts Centre – Cinema & live performances of contemporary dance, mime, jazz & folk. Golden Mile- an area centred on Belgrave Rd., to the north of the city, where the focus lies on the superb range of Asian cultural delights & cuisine. The Hat & Beaver- close to the Shires shopping centre. The Northbridge Tavern- by North Lock. The Mulberry Tree , Birstall, riverside gastro pub. Market Place – the Food hall selling fresh meat , poultry, dairy produce & fish from all over the world. Tues – Sat. The retail market with over 300 covered stalls is open also. Jewry Wall Museum- Collection of the count's archaeology up to the Middle Ages, overlooking the Jewry Wall, which dates from 2nd C & is thought to be part of Roman Baths. Two Roman Mosaic pavements can be seen in situ. New walk Museum & Art gallery you will discover the mighty dinosaurs as you walk in their footprints, be on the lookout for the ‘Barrow Kipper’ and the Rutland dinosaur. Newarke Houses Museum- The social history of the area from 1500 to the present day, inc the history of hosiery, costume & lace industries. Royal Infirmary Museum- history from 1771. Wygston's House Museum of Costume. Shires Shopping Centre- All the usual big name stores under one high, glass-arched roof plus cafes, pizzzeria, etc. Cruise south from Leicester, and keep over to the towpath side just above Freemans Meadow lock as there is an enormous unprotected weir. You can moor up in the Leicester suburb of Aylestone, nr Bridge 106 , it retains the feel of a country village. To the west is Aylestone Meadows which is now a nature reserve stretching for 1.5 miles. Access for shops and the Union Inn is east from Freestone Bridge 106. There is a useful farm shop between Packhorse Bridge 105 and the railway bridge. The National Gas museum is situated in the Victorian Gatehouse of one of the city\\\'s gas works .The museum contains many fascinating displays which tell the story of making, distributing and using gas since the early 19th century. You can see many unusual appliances including gas heated hairdryers and even a gas radio! A re-creation of a 1920s kitchen shows what domestic life was life before electricity became common in the home. After Kilby Bridge the canal continues through much quieter landscape. About half a mile north of Kilby Bridge is the award winning Wigston Framework Knitters museum. open every Sunday. Brocks Hill Country Park & Environment Centre is a 2 .5 mile walk north along a footpath from Clifton Bridge (85) & then via A5199 & B582, but it is well worth the effort as it make a very worthwhile day out. It is a unique environment centre built to demonstrate wind & solar power. Set in 67 acres of parkland with a cafe. Entrance is free. Moor up in Newton Harcourt which is a well known Leicestershire beauty spot, by bridge 80. In a short while you pass Wistan Le Dale model village- take the footpath south from Ivy Bridge (78) to the church and visit this acclaimed Model Village. Open daily exc Tues, with cafe. Visit the Wistow Rural Centre www.wistow.com moor up at either bridge 78 or 80 for access. Call into the tea rooms for a traditional English tea, a light snack or a 3 course lunch - children\\\'s menus also available. Then stroll around the model village and the garden centre. Continuing on down towards Foxton Locks you soon reach the Knibworth Locks & just a mile or so away is Saddington Tunnel which is 880 yards long, lookout for the bats which naturalists enthuse about. The Tunnel was built crooked in 1797. The village of Saddington is accessed from Bridge 72 to the west , the award winning pub - Queens Head in the main street has superb views over Saddington reservoir, and serves a wide range of food. Visit Saddington reservoir built to keep the canal well watered now a wildlife haven. It is a lovely rural cruise to Foxton which is at the base of the lovely Foxton flight of locks. Foxton is the site of a steam powered Inclined Plane, which replaced ten locks and lifted narrow boats 75 feet. It was opened in 1900 but suffered from mechanical and structural problems. The locks were reopened in 1908 and now work beautifully. Whilst here visit the Foxton Museum and gift shop. The well stocked canalside shop offers you groceries, hardware as well as the traditional “roses and Castles” canalware, made and hand-painted on site. Walk along the tow path until you find the friendly British waterways lock-keepers by the Locks. They will take a note of your boat name & tell you roughly how long the wait will be to go through the locks, but there is plenty to do whilst you wait. Moor up after the top lock at Foxton, it should take about 6 hours to get here, but it may depend on how much of a queue there is for the locks. The Canal weaves its way through an remote but attractive stretch. There are no villages on the canal here, Husbands Bosworth being hidden by the tunnel. Look out over the vale of Welland and to the nearby Laughton Hills. Slow down, cruise on and watch mile after mile beautiful and unspoilt countryside unfold . Enjoy an easy cruise as the canal meanders through unspoilt surroundings passing through the Husband Bosworth Tunnel. The Tunnel is 1166 yards long and was opened in 1813. Stop and moor for a while, stroll into Husband Bosworth for a pub, newsagents and general store. The Bell Inn here serves Real Ale & food daily. The Battle of Naesy 1645 was fought 2 miles east of Welford. Here Fairfax\\\'s New Model Army routed the Royalists under King Charles I, ensuring the end of the Civil War. Gently continue your journey passing the Hemplow Hills to your left, and open fields of grazing sheep. 2 Miles east of Bridge 31 is Stanford Hall, a William & Mary brick mansion built in the late 17th Century. On display also here is a replica on an experimental flying machine built in 1898. Teas, shop & craft centre. Open pm Easter -Sept. The next stretch of the canal wanders southwards in a series of loops through wonderful rural scenery with not much signs of habitation. Yelvertoft is a delightful village to stop for a while and there are moorings between bridges 19 and 20. The local is is the Knightly Arms which serves real ales & home cooked food. You can stock up on supplies here as there is a stores, off licence & butcher. Crick Tunnel is 1528 yards long, & has no tow path so if you wish to walk it you will have to go over the top. Meet the lock-keepers at the Watford Locks and they will cheerfully help you on your way through their complex set of locks. Watford Locks raise the canal to it summit level of 412 feet. Four of these locks form a staircase, with a 'one up one down procedure. The new Inn is Canalside at Buckby Top lock & has moorings. The small village of Watford is not to be confused with the large town of Watford in Hertfordshire. Moor up at Bridge number 6 for a true taste of the Orient at the Thai Garden, Restaurant in Station Road. Once through the Watford Locks continue towards the Norton Junction were we meet the Oxford Canal. At Norton Junction you can then go down the Grand Union towards London, and to Aylesbury which is your destination. Moor up just after Norton Junction it is 5 hours to here. The Buckby flight of Locks is open from 10-3pm with last entry at 1.30pm. There are 7 locks along this stretch with only the railway & the old Roman road- Watling Street (A5) to keep you company. The canal is 1800 years younger than the road, but looks more outdated! There is also a canal craft shop in one of the red bricked cottages by the locks. From Bridge 18 you can access the Heart of the Shires Shopping Village- Set around a Victorian Courtyard converted from a selection of Victorian stables and farm buildings, this shipping village offers over 20 individual shops with character ranging from Kitchenwear to Menswear, plus Gift shops and a first class restaurant and tea room. Open 10-5 daily. The next stretch of canal begins to meander as it avoids the hills, but passes directly through Weedon a good place to moor. This charming village has good facilities like a store, PO, garage & takeaways. There are also a few pubs like the Narrowboat by Bridge 26, the Heart of England & the Globe by Bridge 24, and the Plume of Feathers at the aqueduct by the Church. There are good moorings above the church. The next village close by is Nether Hyford, there is also a Pub & stores here. Bugbrooke is a short walk away by bridge 36 , the Wharf Inn Bugbrooke is a short walk away by bridge 36 , the Wharf Inn is canalside by the Bridge, The Bakers Arms & The Five Bells Pubs are in the village. The village also has stores, PO and a garage. The canal then reaches Gayton Junction so turn left along the Northampton Arm to Gayton marina .